Our hearts go out to the millions affected by recent hurricanes and natural disasters around the world. Last week, Sunrun embarked on a mission to Puerto Rico in partnership with local firefighters, two non-profits - Empowered by Light and GivePower Foundation - as well as Zero Mass Water to bring 15,000 pounds of solar, battery storage, and clean water generation equipment to the ravaged island. This was a dual solution to help with two key issues plaguing Puerto Ricans and the recovery efforts: the lack of electricity and clean water. 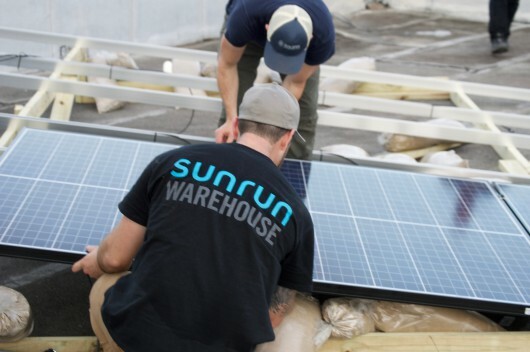 Sunrun donated two 6.6 kilowatt solar and battery storage systems to power life-saving equipment for fire stations in San Juan and the remote town of Utuado. We were able to install this technology under very challenging circumstances in less than two days and deploy the electricity immediately-- allowing firefighters to run critical systems day and night. With the grid down, the fire stations depend on power from unpredictable diesel generators operating on only a few hours of energy a day. For water, Zero Mass Water provided solar powered systems that pull water vapor from the air and condense it into clean drinking water. These systems will produce more than six gallons of water per day for the community. In addition, the GivePower Foundation brought four solar-powered water desalination units that will each produce more than 200 gallons of clean water per day. One desalination unit was given to the remote island community of Culebra, which will help provide reliable, bacteria-free drinking water to the roughly 2,000 residents in need of support. Since the hurricanes hit Puerto Rico, fire stations across the territory have been forced to turn to unreliable and intermittent diesel generators for energy. Without reliable energy to power communication equipment, emergency services were forced to rely on word of mouth to learn of people in need and emergency situations. Rooftop solar power and battery storage will now provide reliable power for essential systems in the fire stations -- allowing the firefighters to restore life-saving communication equipment. These fire stations are also considered community centers for local residents in times of crisis. Power is essential for community members in desperate need of electricity, water, healthcare, and general support. After ten years, this is one of my proudest weeks at Sunrun. Our team embraced the opportunity to provide solar power to support Puerto Rico’s brave first responders and their local communities. And our work doesn’t end in Puerto Rico. In addition to these equipment donations and our prior donation to the American Red Cross, Sunrunners across the country are stepping up to raise $20,000, which Sunrun will match, to provide up to $40,000 in aid to the Direct Relief Foundation. This organization bolsters front-line first responders with emergency supplies to help save the lives of those impacted by recent natural disasters. There is still time to donate, and every little bit helps. Unfortunately, extreme weather events will continue to impact communities around the world and it is essential that we rebuild our energy infrastructure with smarter, more resilient and diversified power sources. Rooftop solar and battery storage is the foundation for the next generation of energy infrastructure. Let’s build a better, smarter future together. Sunrun CEO Lynn Jurich and Marco Kraples speak with Michaela Pereira on HLN about Sunrun and Empowered by Light efforts to restore power to Puerto Rico. Finished solar array the Barrio Obrero fire station in San Juan. 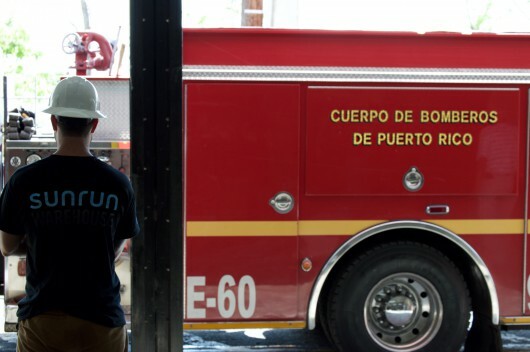 Sunrun worker standing in front of the Barrio Obrero fire truck in San Juan. Sunrun and Empowered By Light workers installing rooftop solar on the roof of the Barrio Obrero fire station in San Juan. 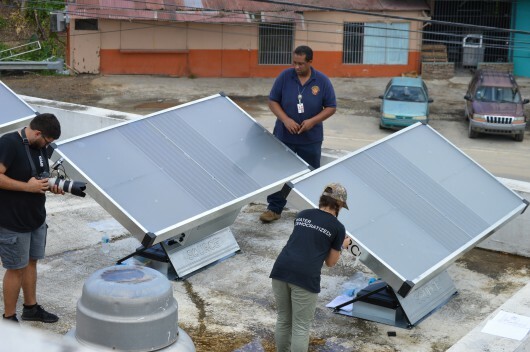 Four SOURCE water condensation machines provided by Zero Mass Energy with installation help from Sunrun, GivePower, and Empowered by Light on a fire station in Utuado, Puerto Rico.